Morningside College is a private, liberal arts college affiliated with the United Methodist Church located in Sioux City, Iowa. 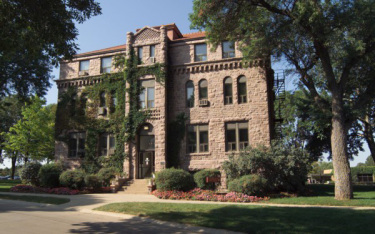 Founded in 1894 by the Methodist Episcopal Church, Morningside is a private, four-year, co-educational liberal arts institution. Morningside has 21 buildings on a 68-acre campus in Sioux City. The building still functions as a college. In Dimmit hall of the college, which is known as hidden hall due to having to go up or down a level to gain access to it, a female student committed suicide by hanging herself from the old heating pipes within the room. Reports of paranormal activity include hearing choking noises coming from within the room when it is unoccupied, and many students have claimed to of seen the apparition of a young girl walking down the corridor into the haunted room, upon following the figure however, the room is completely empty.